Concrete is probably, far and away, the longest lasting building material if it is properly used, while requiring some of the highest energy levels to produce it's raw materials and ship them around. The longevity it provides helps to offset the energy it embodies, but in an age of greater awareness of the environment, carbon footprints, and green building, there are simple things you can do to start a more sustainable approach to concrete fabrication. Whether you are a small part-time countertop fabricator or a large-scale commercial contractor, taking on some of these practices could actually save you money and get you jobs as architecture moves towards green building, and the average homeowner becomes better informed about the environment and the related issues. These are suggestions of different ways to make a move towards a greener business style. Start with the Portland Cement Association. A great place to start is the page on their website (www.cement.org) called Concrete Thinking for a Sustainable World. That's a great place to start learning about green building practices, and what people are doing. Within the adage of "Reduce, Reuse, Recycle," one can definitely reduce the amount of concrete they use in their shop or on site by honing their geometry to their mix design and formwork. To backtrack on the previous statement, extra concrete is always better than not enough concrete, and many times, if not all, you cannot afford to run shy. But then you have to deal with the extra mud. There are large collapsible molds of blocks that will hold a yard of concrete, and you can make little molds for tile or decorative pieces for in the shop. Flexible rubber molds are easy to make and you can pour them a couple hundred times with little prep work. On home jobs, there is always a pile of Styrofoam packing material laying about that makes an interesting concrete mold. You get a funny little garden shape and break that foam down a little more before it hits the landfill. There are glass recyclers out there that break down and sort bottles by size and color. 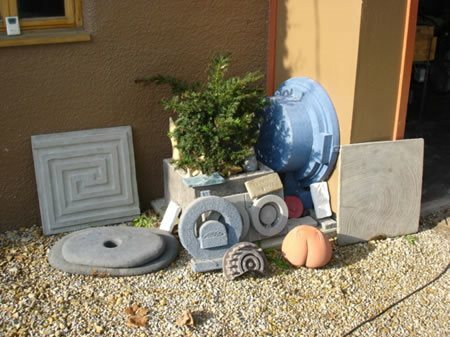 There is fly ash that you could experiment with and find a usable mix design. There are cenospheres for lightweight concrete. You probably have stacks of steel scrap, broken concrete, and beer bottles behind the shop. If it's hard and heavy, it can definitely become a non-traditional aggregate. Ever hear of farmer's concrete? Throw that crap into the big form for the landscaping object you're working on. Don't fire up that mixer if you don't have to. 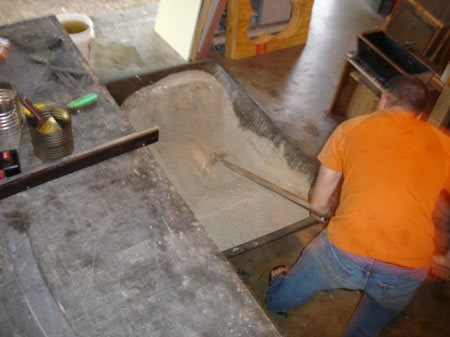 A couple people can easily handle hand mixing 3 cubic feet. Save the gas, the mess, the water, reduce the amount of extra concrete, and burn a few calories. Save the mixer for the bigger pours. A lot of rental companies have a volumetric mixer truck. They are great for small jobs because there is virtually no waste or washout water. The concrete is fresh because it is mixed on site, and some trucks even have color dispensers. The ready mix plant has to go through all the same process for a 1 yard batch as it does a 10 yard batch. Volumetric trucks are great way to reduce some energy consumption without a sacrifice. Various companies manufacture bags and other devices for controlling truck washout. They keep the area clean and the clients happy, and some neighborhoods don't allow washout to hit the ground at all. Take that bag back to the shop and spread the sand and gravel around the yard or put it in the recycled materials pile. Steel are way easier to drive than those 1x2s you've been using, and they have a lifespan of about one million years longer. Steel is the most recycled material on the planet, as well. You can even buy rebar certified to be 100% recycled. While you are at it, invest in some reusable form lumber, especially if you do a lot of curves. It will save you money down the road. Your concrete may know the difference, but your tools don't care if they aren't washed with potable water. And your concrete will still work fine. 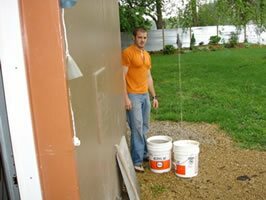 Throw some barrels under your downspouts and drop in a pump for washing. You could save a lot gallons every year. As there are probably as many diesel trucks as there are cell phones in the concrete industry, fill up on some biodiesel if you run across it. Your truck has no feelings on the issue. It burns cleaner, and you can spend a little more money on domestic agriculture, and a little less on foreign oil. Concrete is one of the biggest sectors of the construction economy, as well as one of the most progressive. Green building has a soft spot for concrete, and those techniques are picking up all the time in urban high rises and rural homes and everything in between. Sustainable building is the future of construction, and adopting some simple practices will save you money and make you look better. That is a tough point to argue as the price of fuel goes up. Being green was never really just for hippies, but now it is going to become everyone's problem. Whatever you do, it is not about you, it's for your kids and their kids. Now there is one more little thing to add to the list. While you are thinking about all this, with a beer in hand, think about building yourself a kegarator. Beer and concrete go hand in hand, and a keg will save you money and eliminate all the bottles and cans. Plus it tastes good.